Details below are edited from press release. C-SPAN is visiting Charlotte for a week starting today, as it chronicles the history and literary life of the city for the cable network’s non-fiction book channel (BookTV on C-SPAN2) and history channel (American History TV on C-SPAN3). Charlotte is one of eight cities being featured in a special series called the LCV Cities Tour. The tour is given this name because C-SPAN producers are travelling in specially designed Ford Transit Connect vehicles, which they're calling Local Content Vehicles (LCVs), that are equipped with digital cameras, editing and other recording technologies, and each member of the LCV team is able to shoot and edit video on location as well as make presentations to the community about the work they do for the network. During the week, C-SPAN producers will visit various literary and historic sites, interviewing local historians, authors and civic leaders, including Charlotte Mayor Anthony Foxx and Charlotte Chamber President Bob Morgan. The C-SPAN team will also visit area schools, including Central Piedmont Community College, Providence Day School, and McClintock Middle School. 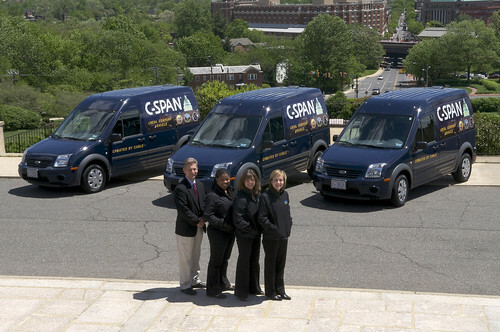 C-SPAN is partnering with Time Warner Cable, the network’s local affiliate, which is helping to organize the week’s many logistics. A Tuesday, August 30 public kick-off event will be held at Charlotte Museum of History, 3500 Shamrock Drive, with opening remarks at 6:30 p.m. from Time Warner Cable, C-SPAN, and representatives of Charlotte Museum of History. The event keynote speaker is local author and Levine Museum of the New South historian, Dr. Tom Hanchett. He'll discuss Charlotte’s unique history and other topics included in his book Sorting Out the New South City and his most recent work, Salad Bowl Suburbs: A History of Charlotte's East Side and South Boulevard Immigrant Corridors. The kick-off event will air along with C-SPAN’s other productions during a special Charlotte feature the weekend of September 24-25 on BookTV and American History TV. For more details, visit www.c-span.org/LocalContent. In the video below, Mark Farkas, C-SPAN executive producer and LCV project manager, explains why they're visiting cities like Charlotte.